Length: 22.5 (From bottom of the motor to top of outlet). Outlet: 1 1/4 (Brass Outlet & Motor Mount) Rated GPM: 10. Motor: 1/2 HP Type: 2 wire(No control box needed) & Ground Voltage: 230v. If your well casing is 3-4" we recomend using a 3" Grundfos Pump. 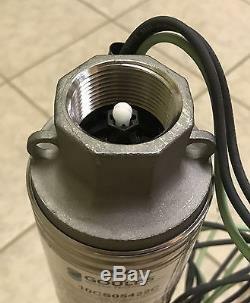 4" Pumps will fit into 4" well casings but 15-20 years later pump may not be able to be removed even with a rig and you will be forced to drill a new well so it is a worthy investment to put in a 3 Pump instead. 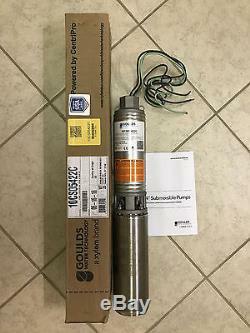 We sell 3 Grundfos Pumps also. We also carry a variety of Fiberglass Pump / Pressure Tanks. About Us: We are a family owned Heating and Plumbing business. We have been in business for over 50 years. We have a customer base from word of mouth referrals(not mass advertising). We rely on repeat customers. So you don't have to deal with various people that can't find your order. The item "New Built in USA 1/2 HP GOULDS 10 GPM 4 2-Wire Submersible Water Well Pump SS" is in sale since Tuesday, June 6, 2017. This item is in the category "Home & Garden\Home Improvement\Plumbing & Fixtures\Pumps". The seller is "hhpac" and is located in Alliance, Ohio. This item can be shipped worldwide.